Matisse’s Three Sisters aren't nearly angry enough to be real siblings. 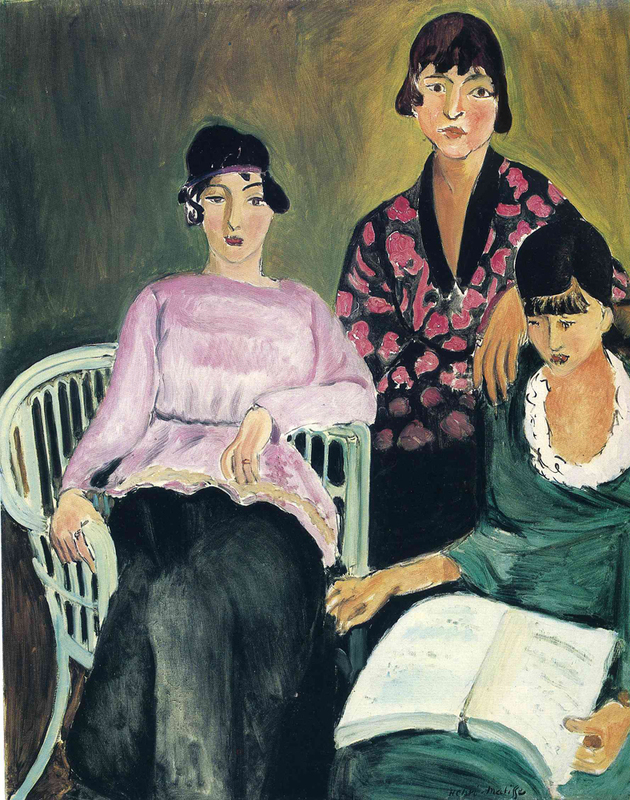 Henri Matisse painted a lot of sisters. Like, twelve. At least. And most of the time in sets of three. As the middle child of three sisters myself, I’m really not sure what Matisse was so captivated by. And where’s the fighting!? Did the sister in the wicker chair steal that pink shirt from sad bookworm sister’s closet? Probably. I already identify with the sister in the back. She’s definitely an even-keeled middle child. Matisse practically painted a halo around her and we all know that being backlit gives off some seriously chill vibes. There’s also the fact that Matisse painted another portrait titled Two Sisters which stars shirt-stealing sister and sad bookworm sister with their arms around each other. Clearly they resolved their earlier argument and subsequently decided to exclude the middle sister from their close-up portrait. That’s totally predictable sibling behavior. But Matisse hadn’t completely gone off his rocker. We can still see his usual touches in this portrait-- the use of line, his characteristically bold color palette, and the bright textiles. Middle child sister in the back is winning at the style competition. And probably at everything else, too.